It has taken half a century for doctoral education to begin to become somewhat grudgingly accepted in architecture. The number of North American universities granting a Ph.D. in Architecture more than doubled between 1998 and 2008. There are new types of doctoral degrees, and new subject areas being explored. The PhD degree is becoming more widely accepted as an important credential for full-time faculty at major universities. New avenues for research funding are reinforcing the value of scientific research in academia and in the profession. More students from the United States are joining programs that have historically been dominated by international students. With these changes, doctoral education is becoming much more widely accepted and recognized in schools and by the profession. 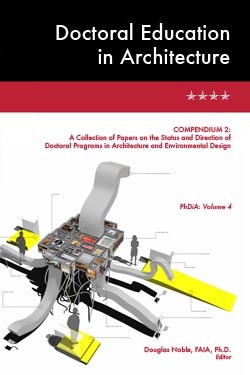 This collection of papers describes the status and future directions of doctoral programs in architecture. Douglas Noble, FAIA, has BSArch and BArch degrees from California State Polytechnic University, and MArch and PhD degrees from the University of California, Berkeley. He is a fellow of the American Institute of Architects.